Striper Xpress Inshore Fishing Charters is the premier striper and speckled trout guide charter boat in Eastern North Carolina. Covering the Neuse River near New Bern, the New River near Jacksonville, and the area inlets, Captain David Johnson has years of experience providing the best fishing outing that will exceed your expectations. Each fishing trip can be customized to fit your needs, and of course if the fish are biting we keep fishing until they stop! View our photo gallery and our typical rates, then contact us to schedule your trip! We look forward to hearing from you. The Striper Xpress: A well maintained 22 foot Xpress aluminum boat with a 115 horsepower Yamaha four stroke engine. It is a comfortable riding fishing machine. I have been fishing for 50 years and have extensive knowledge of the Neuse River in New Bern and the New River in Jacksonville. 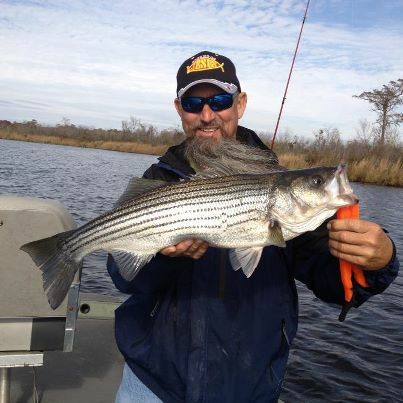 I enjoy fishing for Striped Bass on the Neuse and specialize in top water fishing. I fish for Speckled Trout on the New River, Neuse River and the inlets from Swansboro to Topsail. Or tell us something else here.